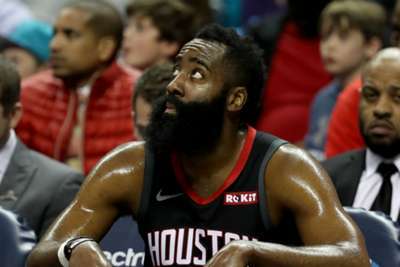 James Harden was frustrated with the Houston Rockets' defensive display as they were beaten by the Memphis Grizzlies in overtime on Wednesday. The Rockets trailed by 19 at the start of the fourth quarter after allowing the Grizzlies to steadily build their advantage at Toyota Center. Belatedly, Houston rallied to force overtime but they were unable to complete an unlikely victory as the Grizzlies held on to a 126-125 triumph. Harden scored 15 points in the final quarter and 10 in overtime as he amassed 57 in the match, but it proved in vain as the Rockets slumped to defeat. "We put ourselves in a hole, we tried to pick it up but it was too late," Harden told reporters. "[In the fourth quarter] I was just being aggressive, we were down 20 so I had to do something." But there were some positives for Harden, who believes the fightback bodes well for the rest of the Rockets' season. "We weren't doing anything [in the first three quarters]," he added. "Defensively we gave them what they want, offensively we weren't aggressive. "In the fourth quarter and overtime we played well. "If we play the way we played in the fourth quarter and overtime defensively, we'll be alright."